The first all blue Persian kittens made their appearance in the early 1880’s in the “cradle of the blues,” England. They created quite a stir when they were shown at the Crystal Palace by Miss Frances Simpson. Today, their origin is shrouded in mystery. The only clue is from an American breeder who reported that Miss Simpson had written her that these kittens came from brown tabby matings. An old English show catalog reveals an advertisement citing “for hire” an imported Silver Grey stud cat. Where was he imported from? Was he, perhaps, the first really pale long-haired blue? “The birth of the blues” however, is traced to the year 1889 in England. This was the year that classes were first provided for blue self cats without white. These classes drew 17 entries, some being only six week old kittens. In only three instances were particulars given, and in each instance the sire was a cat called “Turco”, owned by a Mr. A. A. Clarke who was a fancier and judge. Five years later, two classes were offered for blues and thirty cats competed. A scant ten years after this at Westminister, there were 87 blue adults and 23 blue kittens competing. Miss Simpson was largely responsible for the instant popularity of the blues. She founded the Blue Cat Society of England and helped draw up the first standard in 1902. This standard, by the way, differs little from the standard of today. However, the blue Persians of today bear little resemblance to their earlier counterparts. The majority of early blues had long straight noses, narrow skulls and big ears. Their eyes were green or yellow and many had white lockets or even white belly spots. The basis of our blue pedigrees today can still be traced to some of the early pioneer blues. One such early cat that was to have a great effect on the blues, was a cat called “Darius” who sired “CH Orange Blossom of Thorpe”. The strong points of Darius are listed as the shape and bone of head. The first twenty years of this century the blues showed great improvement. The greeny yellow eyes were replaced by orange and sometimes almost copper eye color. The general type improved. Heads were broader, noses shorter and ears smaller. This improvement did not come all at once, as there were many setbacks. Cats, like other animals, will quickly revert to type if given a chance. Curiously enough, research into the evolution of the blues shows a consistent pattern of areas where improvement is needed. The cats of this era were said to be lacking in the size of eye, expression, eye color and coat length and color. These same failings are recounted decade after decade. Even today, many of our finest blue cats fail to have the large round eye, that tends to give their faces the soft sweet expression so dear to the eye of the fancier. Or, if the eye shape is right, so often the eye color is lacking. The blues steadily improved until the first World War. For a long time after this, there was only one blue champion listed at stud in England. 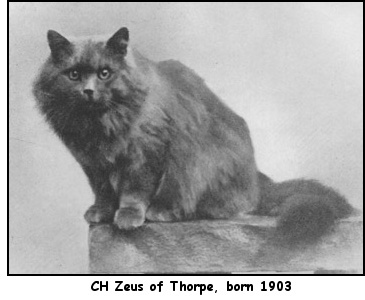 It was this cat, “CH Azure of Hadley”, that kept the fancy going at this time. 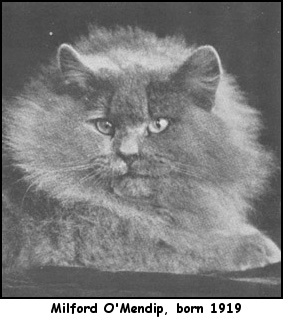 Another early cat to exert influence upon the blue fancy was “Milford O’ Mendip” by “Bembo” x “Dignity of Delamere”. He was born in 1919 and said to have excelled in type, with a fine head, very neat ears and large expressive eyes. His eye color was good but not of a particularly deep color. He is described as carrying a great wealth of medium blue coat with a lovely texture, which most of his stock inherited. He became the sire of the foundation stock of our present day blues. Among those he sired were “Eros of Allington”, “Sweet September of Hawkhurst”, “Townfield Flyfast” and “Sweet Lavender of Dunesk”. The years 1920 to 1930 were called the “golden period” of the blues. 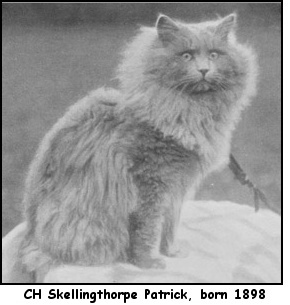 According to Cyril Yeates, noted fancier of the era and dubbed “The King of Cats”, 1923 was the “vintage” year. Mr. Yeates was to have a great deal of influence upon the blues and their improvement. An excellent judge and an efficient show manager, he innovated many changes in the management of shows. In 1935 at the Crystal Palace show, there were 1,141 entries. Mr. Yeates is credited with the organization and success of this mammoth show. His lifelong devotion was to the cause of raising the status of the cat. His wife Gretta is credited with showing the first “peke face” blue in England. The cat was called “Princess Myra” and she was described as “not exaggerated in type with a quaint face”. Photographs of Princess Myra show her to have a lovely soft expression, good muzzle and seemingly pale coat. By today’s standards, she would not be classed as a “peke”, but rather as a fine little blue, though not at all extreme.